Regarded as technically very challenging on all possible routes, Kusum Kanguru is an impressive rock and ice peak which forms the border between the Dudhkosi in the south and Hinku Valley to the north. Its name originating in Sherpa language means the Three Snow-White Gods. This climb is suggested only for participants who have enough alpine mountaineering experience. South-East Ridge: The approach to the South East Face is from the Hinku valley side. From Lukla the base camp can be reached in 5 days. The ascent route to the main summit is through the South East Face. With a base camp at 4360m, two or three high camps are required to complete the climb. 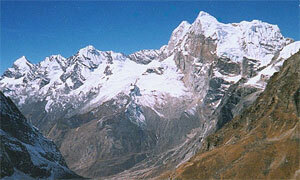 North Ridge: The North Ridge is approached from Monjo on the trail to Namche Bazaar. From base camp ascend steep grass and screed and finally a ramp leading to the ridge proper. Day 21: Drive to Airport for return flight.